We asked David Yarnold, President of National Audubon, why bird conservation matters. He says that preserving wild places and preserving the links in nature's chains allow wildlife to thrive. Where birds thrive, you're going to have clean water and clean air, and that's good for kids, and it's good for birds. The sound that especially moved him was that of Sandhill Cranes. Picture the sun coming up over the Platte River in Nebraska, and the sound of the cranes, lifting off in waves... Learn more about Audubon and their work at Audubon.org. We asked David why bird conservation matters. And once again about those cranes? 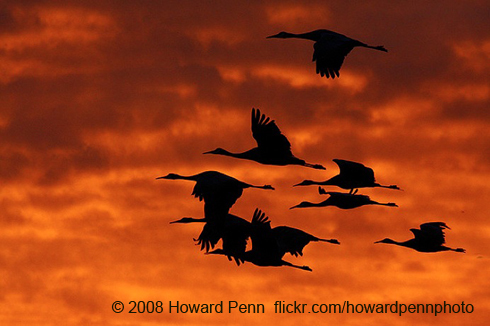 “So if I do have a sound in my soul now, it’s the Sandhill Cranes. Bird sounds provided by The Macaulay Library of Natural Sounds at the Cornell Lab of Ornithology, Ithaca, New York. Calls of thousands of Sandhill Cranes recorded by A.A.Allen; calls of Sandwich Terns  recorded by J.H. Berry; Brown Pelican juveniles  T.A. Parker.